The easiest way to find a file is to load a filename into an 11-byte buffer. 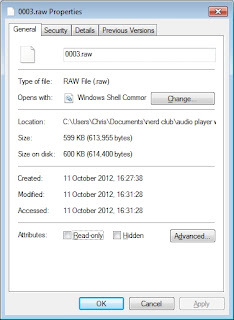 The easiest format to use is the name, padded with spaces plus the extension, minus the full-stop; so wav001.raw becomes wav001[space][space]raw. Or, perhaps more accurately, WAV001[space][space]RAW (since FAT16 likes to store filenames in uppercase). 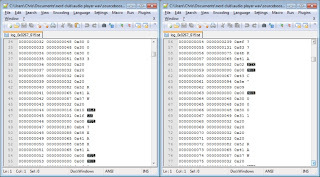 The first eight bytes are the file name – FAT16/MSDOS only supported up to eight characters in a filename. Followed by time stamps for the file creation/modified date. Now we just read the root directory, comparing the first 11 bytes of each 32-byte entry in the root directory to the bytes in our filename buffer and if they match, we’ve found the file we’re interested in. Once we’ve got our file, we need to work out the file-length (in bytes) and the starting sector for the first cluster of data. 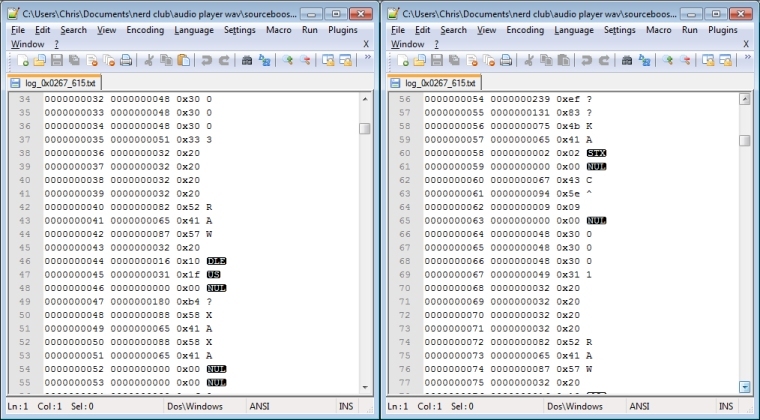 Bytes 28-31 represent the file length, starting with the least significant byte of a 4-byte value. If we know which sector the actual data begins from, and which cluster to begin reading from, we can calculate at which sector the cluster begins. If we jump to sector 647 and start reading back the data, we find that there is, indeed, data in there! So where’s the rest of the data? That’s where the FAT table comes in! This tells us where in our FAT table to find the next (two-byte) cluster number. Since the FAT tables themselves are written across a number of sectors, we need to convert this cluster_doubled value into a sector and byte offset, to read the actual “next cluster value” back. The remainder is the byte offset. Since the FAT table begins at sector 143, we add zero to this, open the sector (using our earlier functions) and read back all 512 bytes. When we get byte four, this makes up the least significant byte of a two-byte (16-bit) value. Byte five is the most significant byte. This tells us that the file continues at cluster 0x0003. We continue reading data from the sector(s) and calculating the next cluster where the file continues until we’ve either read back the entire file (total bytes read > file size in bytes) or the FAT table returns 0xFF as the next cluster (this is a special response to say “no more clusters for this file”). This is summarised in the following function (remove comments around UART calls to see what the microcontroller is actually doing when calculating next FAT clusters). nextFatClusterDoubled=nextFatCluster<<1; // this is the same as multiplying by two!